I know I talk a lot about poop, but right now… THATS my life. I walked in the door today and the entire house smelled like a dirty bathroom in a Mexican Restaraunt! I’m not being racist, it literally smelled like burritos and turds. Appartently both the kids had poopy diapers for a while before I came home and the burritos we had eaten for lunch smoldered from the decaying process in the trash. It was eye watering! The smell extraction process should have required a hazmat team but I really didn’t feel our crisis required government intervention. So I did it myself! All the trashes were taken out, kids changed, and the mother of all oil burners was lit. Yet as I sit here at my computer, I smell it. I can smell a poop. It is only right near my computer….In front of my face. When I look down I expect to see it sitting on the tab key, but no. 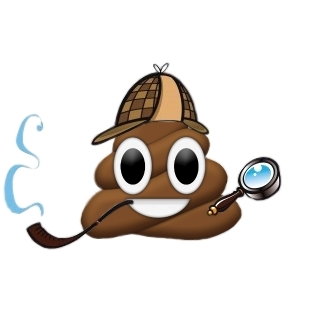 It’s The Mystery Poop Log. It’s haunting me with it’s appetite killing aroma and I can feel my hair falling out as the stress builds. Sigh…I can’t wait for the day when my house smells like it should… POOP FREE!